We at Lost Cowboy love old things, that is well known. However, we also love vintage-inspired new things like the graphics designed by Yellow Owl Workshop. Yellow Owl Workshop offers things like greeting cards and prints with great graphics, including things like old-school cassette tapes and vintage Polaroid cameras. 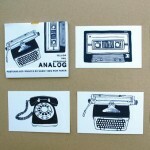 In addition to the cards, Yellow Owl Workshop has some cool ink stamp sets. 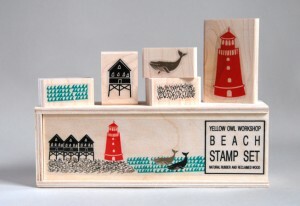 In the spirit of the current season we like the Beach Stamp Set. Check out Yellow Owl Workshop here. I recently wrote about my discovery of the plum lemon tomato and my experience stuffing it. Well, I went back to the market and the vendor – Mivida Gardens – from whom I first purchased this great little tomato to tell my story and purchase more. I told the lovely woman who introduced me to the tomato about my experience and she suggested that I should try cutting the tops off the tomato to stuff them instead of slicing them lengthwise as I did. She had a dozen or so more of the plum lemons, and mentioned that they may be the last of the season – so of course I bought them all. This time I made a salsa with them – and a few red plum tomatoes for color. The result was a lovely fresh summer treat. Speaking of salsa, I want to officially endorse the tortilla chips of Go-Mex. There are many many options for corn chips these days, and they can vary greatly in quality, price and ingredients. The other day I picked up a bag of Go-Mex’s Organic Yellow Corn Lightly Salted Tortilla Chips and they were just about the most perfect chip to go along with my fresh salsa. I went back to the store to buy more of the same and also found a bag of the blue corn variety. Go-Mex is my new favorite chip. I will be traveling to other parts of New England for the last two weekends of August, so I am looking forward to this weekend as an opportunity to enjoy the local high-season summer activities in New Hampshire’s greater Lakes Region and Mount Washington Valley. I have full days planned including Farmers’ Markets, Arts and Craft Shows and my latest obsession – auctions! Full reports to follow. Wherever you are in the Northern Hemisphere, I wish you a great weekend and remind you to stop and appreciate some of the little joys summer offers – stop at that farm stand for the perfectly ripe tomato, wade in that lake you drive by all the time, squeeze in a picnic in the park, or listen to music from your favorite summer of your childhood – you’ll be so glad you did. For my friends on the other side of the equator, do the same with your favorite winter weekend pursuits! Lost Cowboy is powered by	WordPress 5.0.4 and delivered to you in 0.864 seconds using 42 queries.